when you tap Call Button shown below. * Please note that Thai and Vietnamese is available 9:00-18:00. Choose your language and OS. User Guide for Tourist Information will be shown (PDF). What is available at Tourist Information? Please don't hesitate to ask for event information, tourist facilities information, neighborhood information, transfer information, etc. 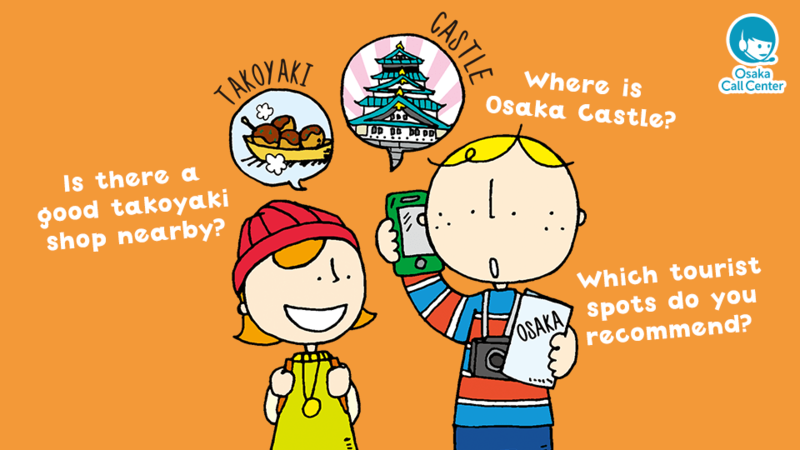 Can I get convenient transport ticket information in Osaka? Yes. Ticket information to serve your purpose is available. I was disconnected while I was talking. What can I do? Please check transmission status, and call us again. Your call history is saved, and guidance will resume. These Points to Note are for using the "Tourist Guide" service. This service is for instruction and introduction, and reservations or sales of any kind are not conducted. Depending on the network environment and traffic conditions, there may be an inability to maintain a stable connection. Connection rates depend on the data plan to which you have subscribed, and additional fees may be required. When using smart phones and tablets other than Apple devices, please use Android 4.2 OS or above, and the latest version of Google Chrome for a browser. Without using the above system requirements there is a possibility you will be unable to use this service. This service is only able to be used within Japan. The following is the Terms of Service that govern the use of LiveCall service (“the Service”). Using the Service, you agree to read, understand and comply with the Terms of Service. You shall not use the Service if you do not agree to the Terms of Service. The Service provider company shall be able to change the Terms of Service and the information published therein at any time without notice. The Service provider company may make improvements, changes, modifications, or cancellation of the contents, programs or product information of the Service without notice at any time. The customer cannot use the Service and the website of the Service to investigate functions, performance, or availability as a measurement of benchmark or reverse engineering. The Entity may record calls for the purpose of improving service quality in the Service. The Service provider company does not make any guarantees concerning the following items. The contents of the Service meet customer's requirements. The Service shall not be interrupted. The Service will be provided in a timely manner. The Service is completely safe. There shall be no defects in the Service. No error shall occur in programs or data provided by the Service. The information that can be obtained through the Service is accurate and reliable. Data transmitted or received through the Service is stored in a predetermined server, transmitted to other parties, or displayed on the screen. For direct, indirect, incidental, derivative, special and punitive damages (including lost income or expected profits, or loss of business) that occurred with respect to the implementation and use of the Service, the Entity and Service provider company shall not be held responsible, whether or not the damage was caused by a third party or the Entity and Service provider company was informed in advance of the possibility of such damages (unless there is intent or gross negligence in the Entity and Service provider company). The Entity and Service provider company shall not be held responsible if the performance of the obligation of the Service has been rendered impossible or delayed due to circumstances beyond the Entity and Service provider company's control. The events of force majeure include but are not limited to government actions, war, riots, strikes or labor disputes, technical troubles, internet unavailability, power outages, communication trouble, weather, floods, fires, explosions, natural disasters, regional emergencies, and so on. The Service provider company reserves all rights pertaining to the Service subject to the limited rights explicitly granted under the Terms of Service. No rights other than explicitly stipulated within the Terms of Service are granted to you. The original Japanese text of the Terms of Service is the official, authoritative version. Translations are provided as an accommodation only and should be referenced with the Japanese text which is the only version that is intended to have legal effect. Please see the below URLs for introductions regarding the Entity and the Service provider company.